Patient engagement and activation is not only a core principle of successful person-centered care, it is essential in any economy and costly to do otherwise. Patients perceive improvements in their quality of care when they are able to manage treatment and life challenges. Engaged patients allow health care organizations to benefit from higher efficiency and increased capacity. The Oncology Interactive Navigator™ is the person-centered, virtual navigation and patient empowerment intervention that engages patients to actively participate in their care. The results of a pan-Canadian study demonstrate that patients increased their sense of competence, felt supported in their autonomy and were empowered by the OIN™. Today, patients expect on-demand, high-quality information as part of their care and survivorship. The OIN fulfills this need and is the ideal support for health care organizations wishing to engage patients in person-centered care. Covering 24 different cancer types, the OIES educates and supports cancer patients in an interactive format. In use at hospitals across North America, it has been reviewed by hundreds of medical professionals. After more than a decade of helping patients, it is being discontinued and replaced by the Oncology Interactive Navigator. Contact us to upgrade your OIES license to the Oncology Interactive Navigator solution and receive your preferred rate. Cancer patients face a host of emotional and daily living issues during the cancer journey. Recognizing these issues as factors affecting treatment, person-centered care aims to address these challenges and the OIN™ is the ideal tool to help achieve this goal. Doctors, nurses, counselors, patient navigators, dietitians and those who direct patients to appropriate support resources are some of the professionals who benefit from using the OIN in the clinic. Patient encounters and teaching moments are more personalized as the OIN's medically-reviewed content delivers messages consistent with those of care providers. Patients supported with the OIN along with consultation perceive their care to be extended into their communities when able to use the OIN at home. This is reinforced when patients find local support resources in just a few clicks using the searchable custom database in the OIN. The OIN is written for patients with a patient's perspective. Choices affecting treatments, effect on everyday living and psychosocial issues are addressed together. Created using person-centered principles, the OIN provides actionable content that builds patient confidence and competence. Patients take active roles managing their health because they see where they have the control to make decisions. The OIN engages the whole patient, helping people live well with confidence at any point in the cancer journey. A majority of people using the internet for health-related information do not understand the information well. Health care professionals have little time to communicate with patients and repetitive teaching takes up almost 45% of this time. Up to 80% of the information given during consultations is lost immediately due to patient stress. The result is many patients do not understand their care and their role in it. Patients become dissatisfied and distress rises. Increased emotional labour and repetitive teaching causes health care staff burnout and turnover, resulting in hiring and training costs. In this economic climate, health care organizations must make the most of existing resources. Cultivating patient engagement reduces the burden on staff. Health care professionals spend more time with those who need it the most. Engaged patients are more satisfied with care when empowered and able to take ownership of their wellness. Intelligent, more effective patient use of existing resources allows health care organizations to increase efficiency and capacity. The Oncology Interactive Navigator™ is the subject of on-going studies in patient engagement within person-centered care. The OIN™ was integrated in the clinical environment in 7 major cancer centers across Canada with diverse patient populations. Newly-diagnosed people from 2 different cancer types were given the OIN as an information prescription and surveyed before and after the study period. Confidence, competence and perceived support for self-management increased with higher usage. Many patients reported OIN use reduced distress, fears and anxiety. Patients indicated it was instrumental in helping them adjust. Patients identified coping strategies and the hospital/community support resources as highlights of the content. Data showed high levels of patient engagement. Clearly, patients were engaged by the OIN. 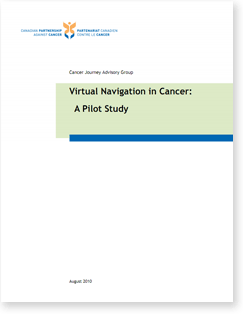 The study, Virtual Navigation in Cancer (PDF, 920 kb), was funded by the Canadian Partnership Against Cancer (CPAC) and published in August 2010. The next phase of independently-funded and investigated study will place the OIN within a randomized control trial to explore further empowerment and cost effectiveness over a longer survivorship timeframe. Download the final report (PDF, 920 kb) from the Canadian Partnership Against Cancer website.